I showed them a two slit interference demo, then contrasted this with what we’d expect to see if we shined light through two slits. We defined these observations as “wavish” and “non-wavish” behavior, respectively. Then we did an experiment with a coin and two cups (not these, the ones we used had tops on them). I put a coin in one of the cups, and then mixed up the cups so that no one knew which cup had the coin. 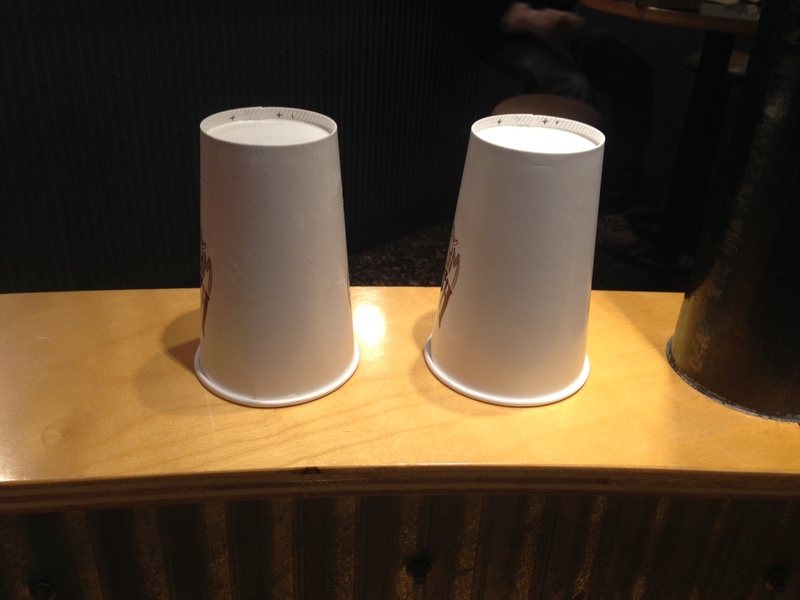 Two “carriers” then took the two cups on separate paths, carefully, so as not to reveal the path of the coin. When they got to their destination, the teacher of the course mixed the two cups again, and then a “screen” checked to make sure that the coin arrived. This experiment, we said, caused a “wavish” pattern. We then did the experiment two more times. In the next run, a “detector” on both sides took the cup and shook it, so everyone knew which cup held the coin. The third time, however, the detector just peeked under the lid of the cup, revealing to no one else what they saw. We agreed that the first of these latter experiments would cause a “non-wavish” pattern, but the third one tripped people up a bit. Who did the detector represent? Did it matter? Is it possible for the an individual person’s perception of the pattern to change, depending on what they knew? Physics has solid answers to these questions, and I revealed them eventually, but it was cool to hear the students arguing about what made the most sense. As science teachers, I think we sometimes take for granted that students approach this work with the same empiricism that we do. But to these students, the idea that a pattern might change to something else when someone whispered information in your ear wasn’t so far fetched! But the thing I was really excited about was how seriously the students were taking the process of recording notes in their Consensus Notebook. I posted about this a while back, but it’s a creation of mine that’s brand new this year – an outline of all the content for the year, with very little information and a whole lot of blank space for note taking. This section, for example would get filled up with suggestions like, “independent variable before dependent variable” as students realize what’s important to keep in mind. It’s a work in progress, but so far it’s progressing really nicely. 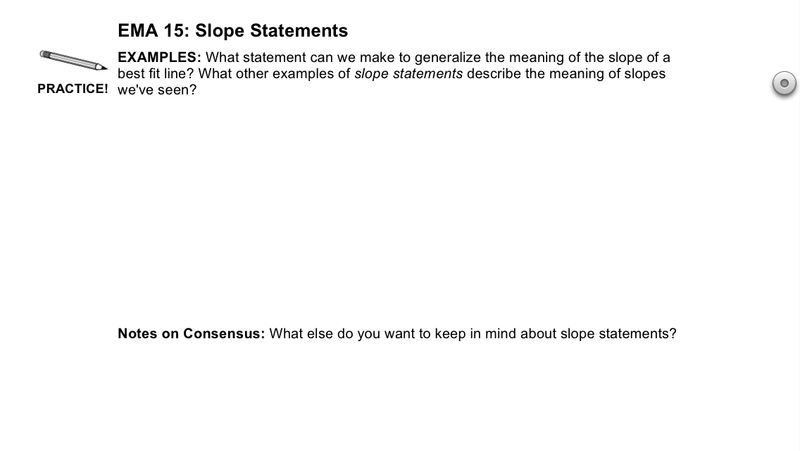 I’m still figuring out how to use it (and so are the students, of course), but I think it could be a really valuable addition to the process of constructing knowledge by consensus, especially with ninth graders. More than anything else I’ve seen before, it helps students understand that what they’re capable of doing or using is so much more than what they have on call from memory at any given moment. I’ve tried to make a big deal out of discussing uncertainty as a range of possible values. This gets into considerations of significant figures eventually, but first it’s just recognizing that we can learn more about an experiment by looking at how variable the results are. You can see on this board that there’s some variability in the points. In fact, this variability increases as the “amount of fertilizer” increases. 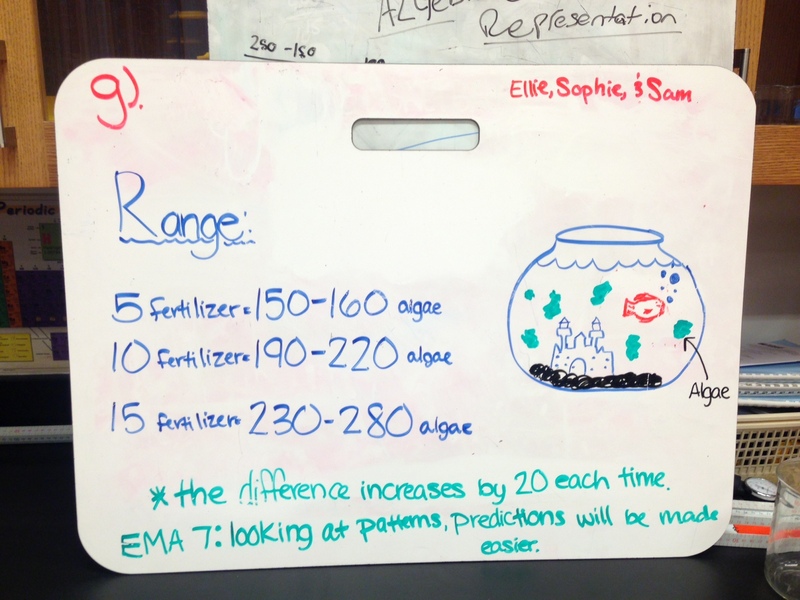 This group whiteboarded a question focusing specifically on this range. As they mentioned, they saw a pattern in this variability – the range of possible values increased as the independent variable value increased. Hey, isn’t this what we saw with the ball bounce experiment? Last night I attended a meeting of “Etkinists” – teachers who have graduated from Eugenia’s program and are now in schools across New Jersey. 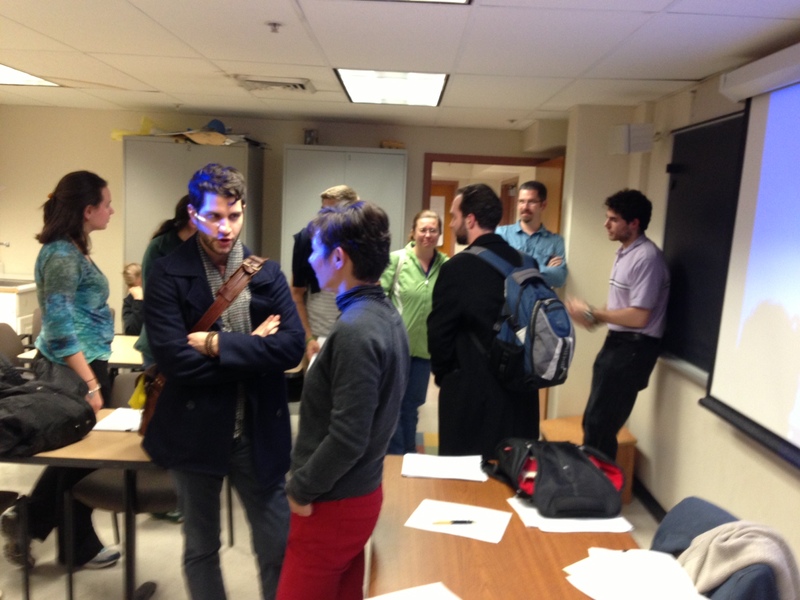 They get together once a month to talk physics teaching, and catch up on old times! This meeting was about standards based assessment. A teacher had developed his own method of keeping track of standards, and wanted to share his ideas with the group and get feedback. Seeing this teacher’s interpretation was awesome. There were some crucial differences from any ##sbar system I’d seen before, some informed by Eugenia’s program and some totally unique. The one that stood out most of all was that this each of the skills in the course was accompanied by a rubric, detailing exactly what consisted “Distinguished, Proficient, Developing, and Basic” work. This kind of blows things out of the water for me, and it makes me realize I have a lot of work to do preparing descriptions of my ninth grade skills. For example, his Kinematics Standard 4 reads: Student demonstrates understanding of the connection between velocity, acceleration, and slope of graphs. Change this to “I understand…” and this is a pretty standard ol’ standard. But then he goes one further, giving students a detailed explanation for each rubric item. 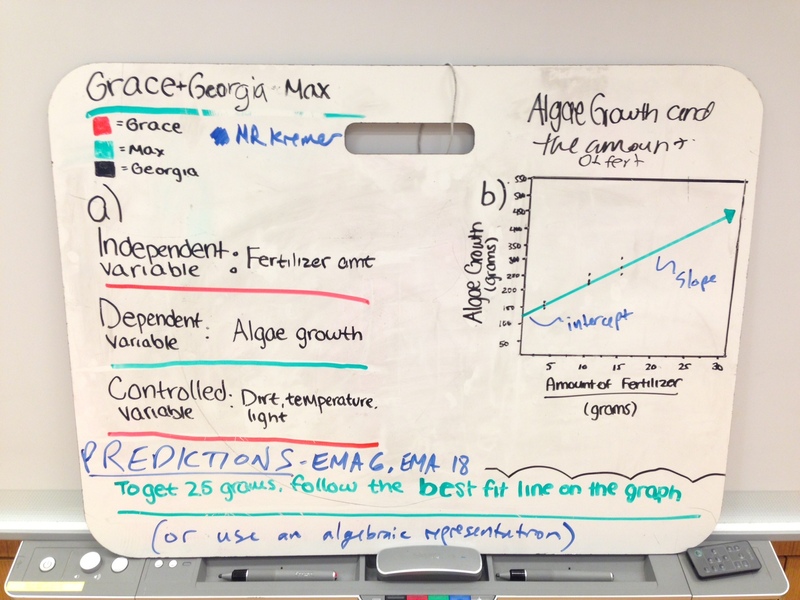 Distinguished: Student demonstrates understanding of the slope of a graph by correctly identifying the value based on information given in other representations. Proficient: Student makes minor errors in calculating slope or sign of slope. 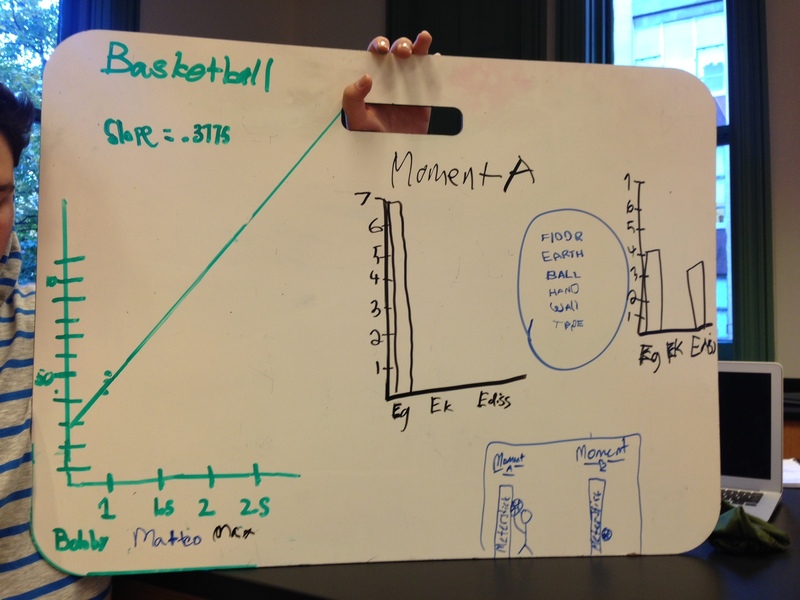 Developing: Student confuses the slope of the graph with the wrong physical quantity. 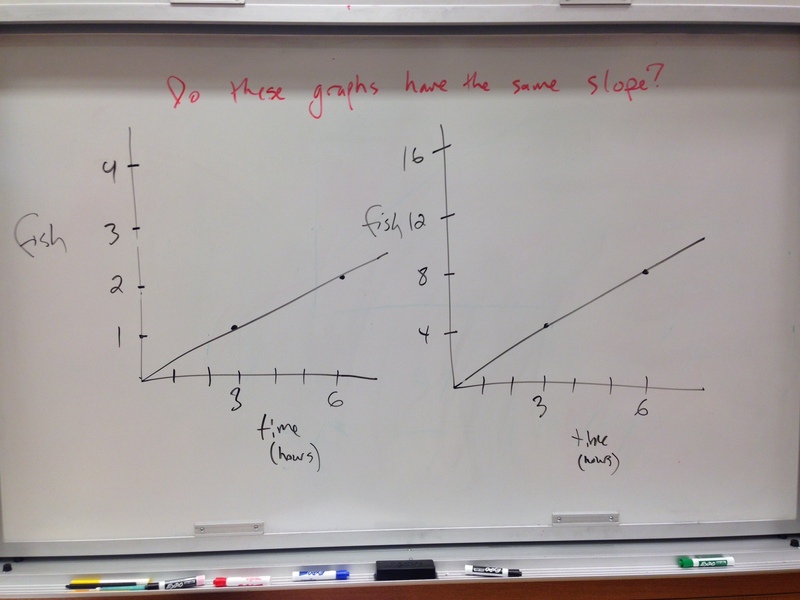 Basic: Student does not show any understanding that the slope of the graph is related to any physical quantity. For me, this has huge implications for quiz corrections and self assessment. Imagine if instead of having a simple “answer key”, students were comparing their answers to exemplars of distinguished work. It’s tricky, of course, but I think there’s a lot there! Another element of crossover between PUM and Modeling that I’m having some success with so far is the idea of calculating an index. Indices are important in both curricula, but only PUM identifies them by this name. In the motion unit, they start with “popcorn popping” index, and “steepness index” for slides, and then move on to “fastness index”, which eventually becomes velocity. In this energy first sequence, we’re using energy experiments to lay the groundwork for slope analysis in CVPM (right around the corner!). The crucial experiment here is the bouncing ball. Students all know by this point that some energy is dissipated when the ball bounces, but only some realize that we can quantify how much energy dissipates in our LOL. These two boards show the contrast. 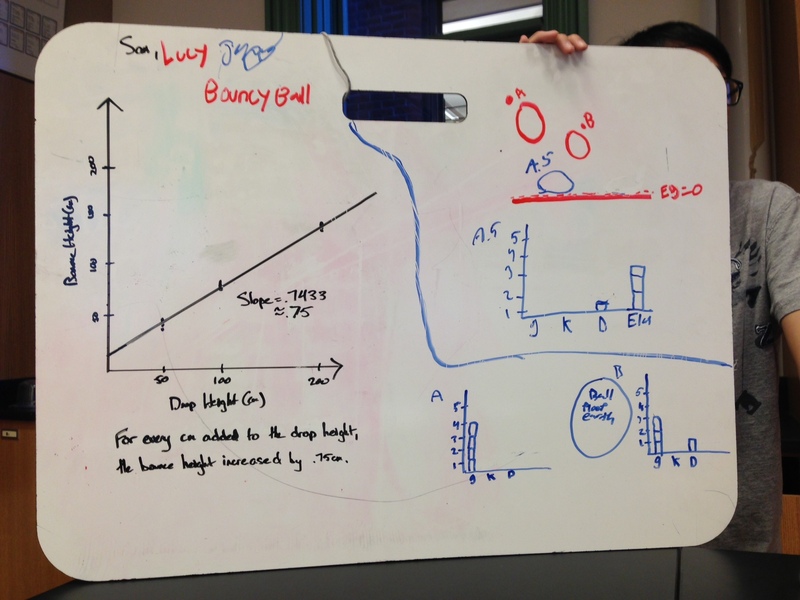 This group calculated a slope of 0.75, and showed a transfer from four blocks of gravitational energy at the drop height to three at the bounce height. A connection!! This group shows dissipated energy also, but they’ve calculated a slope of 0.38 for their ball. In their LOL, however, they’ve shown seven blocks of gravitational energy transfer to four blocks – very inconsistent with the slope! I made a handout with a graph that shows three different balls, each with nice round slopes of approximately 3/4, 2/4, and 1/4. Homework for tonight is to calculate the slopes of the trend lines, and draw an LOL for each. Today in AP physics was our second day of working with circular motion. I’ve wanted to do something with the iPhone accelerometer for a while, and this was my chance!! I strapped the phone to a spinning platform, and students measured the period of the rotation of the phone. I used an app called xSensor to record the acceleration data on the phone, then exported it so that students could see it. Students then had a discussion about which axis of the accelerometer to use (there are three), arriving at a vector sum of the x and y values. They then used this to figure out the radius at which the accelerometer must be living in the phone. No forces yet – just acceleration. We did Eugenia’s derivation of v^2/r from the new College Physics text (and the ALG) so we haven’t talked much about force yet. We had no way to figure out whether or value was correct, but I suspect some systematic percentage error in the accelerometer. If we’d had time, we might have done two different radii, and checked to see if the value was consistent. Attending a Physics Teachers NYC workshop this morning (Or rather, a meeting of STEM Teachers NYC, as it has been recently renamed), and talking a little about magnetism and the atmosphere of Mars. This may not be true about all cow magnets, but it was true about the ones we were playing with! 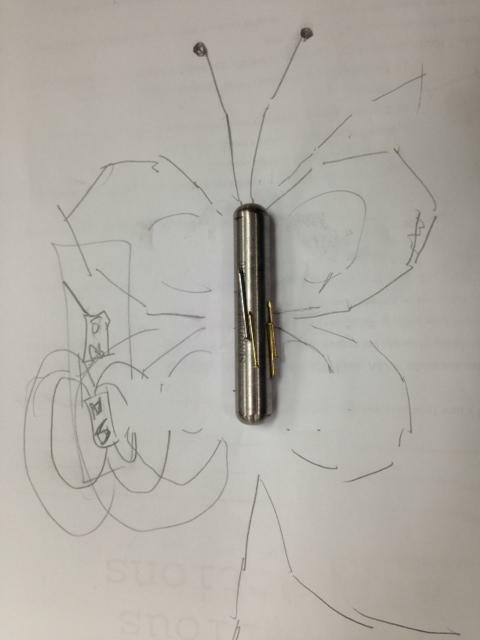 Our next question was why you’d make a magnet this way if its purpose was to sit in a cow’s stomach. 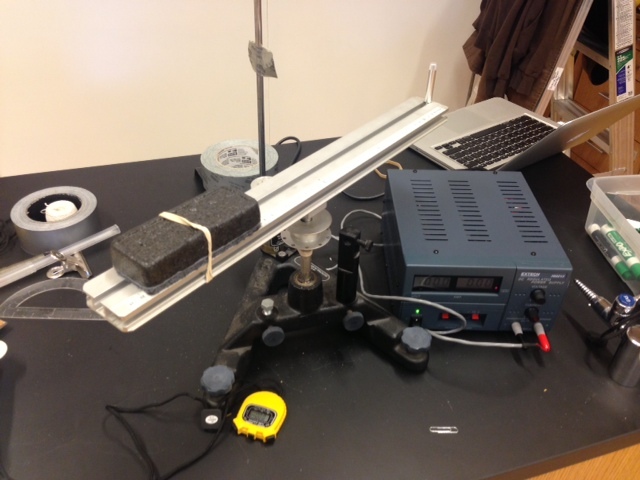 These pictures provide a clue… Nails on the cow magnet lay flat against the device, as shown above. 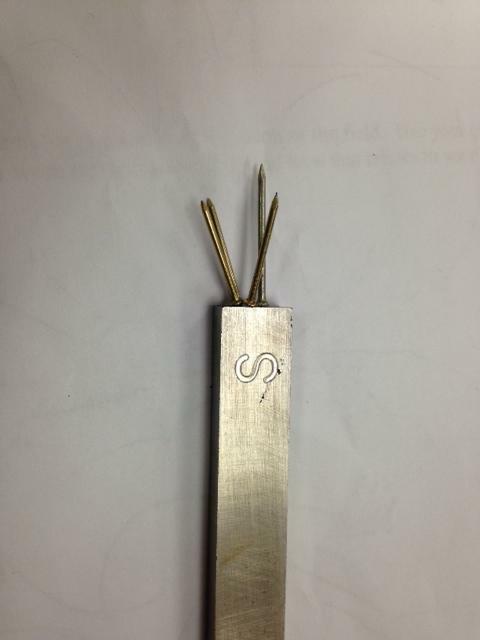 With a conventional bar magnet, sharp metal pieces are in a stable state when they’re sticking out – pointy end first. Not so comfortable for the cow!! 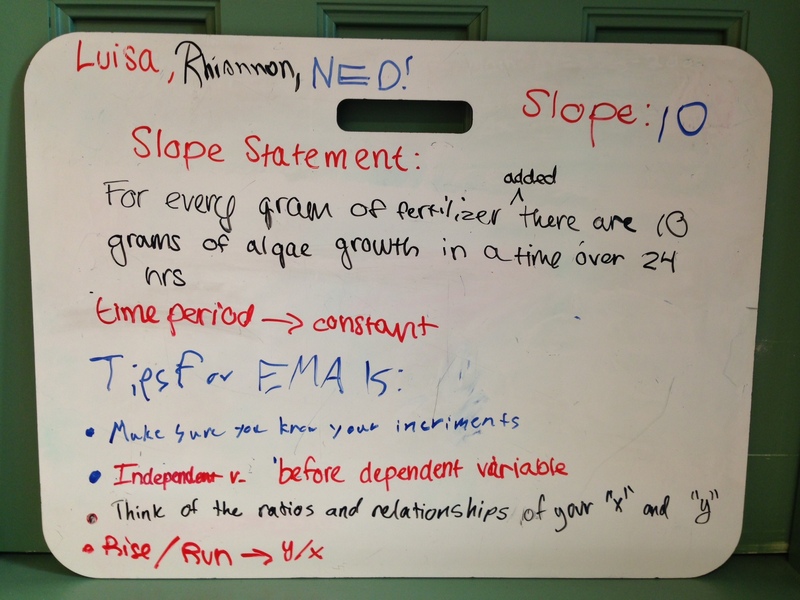 Ninth graders who have taken algebra are aware that slope is calculated with “rise over run” but they often haven’t encountered situations where the data points don’t lie precisely on a line. That is, they don’t *really* understand what’s going on when they do that calculation. So data that’s NOT perfectly linear – like the data we collect in physics class – helps to make the distinction quite nicely. We had a surprisingly animated and passionate conversation in both my ninth grade classes about how to calculate the slope of a best fit line by hand. Many students were convinced that it was more “accurate” to use points from the data table itself, but they were confused that the slope they calculated was different depending on what points they chose. 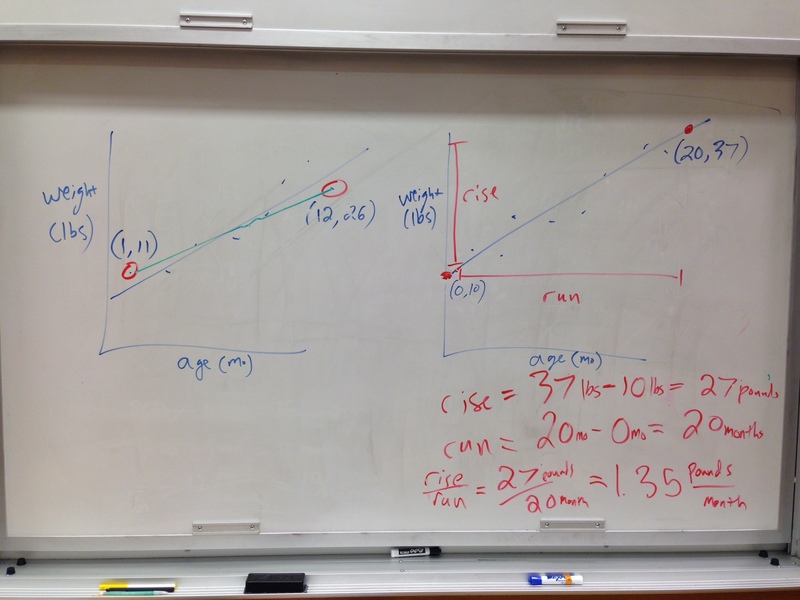 In this class, a girl drew the green slope on the left herself, making the argument that the slope you’re calculating when you use those points is for a different line than the trend line. Why yes, it is!! A quick on for now… My colleague suggested this as a brief activity to dispel the idea that we can just count boxes and be done with it. For me, it was really short, like 3 minutes, but I’m hoping that it will be enough to refer back to when students inevitably make that mistake. I posted a few days ago about how difficult it was for students to explain predictions using the conservation if energy. I gave a quiz on this today, and many students indeed had a hard time. However, it’s still clear to me that it’s worthwhile. This is an answer given by a student who remarked, “This is hard!” while we were practicing these questions in class. 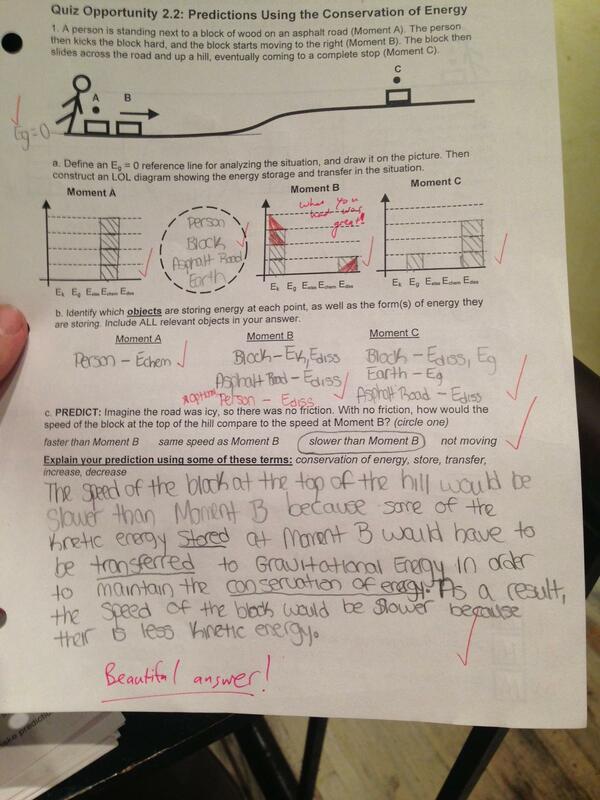 Happily, he figured it out, and gave one of the best answers in the class! !